Paul Bocciolone Strandberg (Swedish mother – Italian father) was born July, 21st 1949 in Malmö, southern Sweden. He started on guitar at the age of 14, playing in an American folk music group. One year later he started to study the trumpet with a professor from the local Symphony Orchestra. In his late teens he also played in brass bands and formed a trumpet, clarinet and banjo trio. In 1972, after some years of doubling on guitar and cornet (and also singing and composing popular songs), Paul formed the group Scaniazz, aiming at a genuine 1920s sound. They were five plus a singer. It was natural to play tunes from Clarence Williams’ records, and he also started to experiment with arrangements of odd tunes. The group performed weekly as the regular house band in different places in Malmö. In the spring of 1975 Scaniazz made a tour of 23 Swedish towns and they also played regularly at Vognporten in Copenhagen. They appeared at several festivals all over Europe: San Sebastian, Spain (1975, 1976); Breda, Holland (1976, 1977) where they became 2nd in the band competition. They started extensive touring in Holland, Belgium and Germany and also made three tours of England 1977-1978. Between 1979 and 1981 there were tours of Poland and Norway. In 1977 the band’s first LP “Some Like It Hot” was released. At the end of the 70s and beginning of the 80s Paul played in a Swedish popular and folk group doubling on guitar and banjo, with many appearances on radio and TV. In 1981 Paul started The Absalon Orchestra, a group concentrating on hot dance music, first with five members, later augmented to seven. This group appeared at the Breda festival in 1987. With Scaniazz Paul played at the 1982 “New Orleans Jazz and Heritage Festival” in New Orleans and was honored with the ‘Certificate of Merit’ by the city. Tours in England and Holland followed the same year. But in 1987 when some of the key members either moved or ceased playing, the original spirit faded and Paul thought it better to disband than to lead a ghost band. In 1983 Paul played first cornet with the famous danish group Peruna Jazzmen, which was modeled after King Oliver’s Creole Jazz Band. He toured with them in Holland and Germany. After starting up the jazz club “Hot House” Paul became heavily involved in jazz activities in his hometown Malmö. In the middle of the 80s he started to teach at the “Jazz institute of Malmö”. Many repertory bands resulted in this ‘boom’ in which Strandberg played, sang and wrote most of the arrangements. Among these bands were: HOT HOUSE JAZZMEN (Lu Watters/King Oliver style), MOONSHINE (Bessie Smith), HOLIDAY MAGIC (Billie Holiday) and ORIGINAL JAZZMAKERS (Clarence Williams, Tiny Parham). As a result Paul Bocciolone Strandberg was given the “Cultural Award of Malmö Town” in 1989. Paul took part in activities at Malmö College of Music and played banjo on one of the first recordings in history of Suite No. 1 for Jazz Orchestra by Dmitry Shostakovich. He was also on the board of a new jazz club that mixed classic and contemporary jazz. In 1990, when the club organized a concert in tribute to Bix Beiderbecke, PAUL AND HIS GANG was founded. In 1992 the band toured Hungary and Czechoslovakia, and appeared at Jazz Festivals in Switzerland and Holland. The group won the prestigious competition at Europe’s biggest festival for traditional jazz in Breda and made a very well received record debut the following year. During the next two years the band appeared at the major Swedish jazz events and in 1997 again played in Holland; and at the famous International Dixieland Festival in Dresden, Germany. Stomp Off Records released the group’s second CD. Besides activities with his own “gang” Paul Bocciolone Strandberg toured regularly in Europe with the HOT HOUSE JAZZMEN as well as with the ORIGINAL JAZZ MAKERS. He also played sousaphone in the SWING KINGS quartet. Between touring and playing Paul has also been active as essayist and reviewer of classic jazz. As the 20th century came to a close Paul continued to keep the music of the jazz age alive, finding new territory in France and Italy for his band. And in the year 2000, Paul and his Gang made their first overseas tour performing among other places in Chicago and Davenport as well as giving a concert in Toronto, Canada. 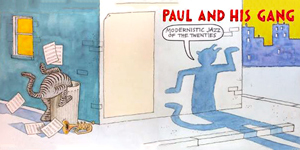 Between 2000 and 2002 Paul had his own weekly radio show, producing more than 100 two-hour length programs centered on the first period of jazz. Around the same time he commenced to, together with Kiki Desplat, tour southern Sweden with a self produced musical theatre piece about their passion for jazz music aimed at families and children. This work with children continued in 2006-2007 when Paul was engaged to play sousaphone on stage in “Dolly’s Beauty Shop”; a very successful newly composed and written opera. In 2001 Paul Strandberg was awarded with the prestigious Louis Armstrong prize in Stockholm for his tong and passionate service for the traditional jazz. Besides continuing to lead his bands he has made many appearances as special guest with foreign orchestras. Once a month he is the host in “Paul’s Playhouse” that is a jazz club with appearances of classic jazz bands and with well-organized and spirited jam sessions. 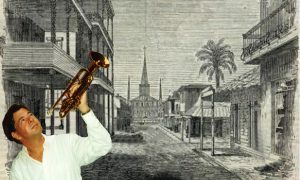 The new millennium also brought Paul engagement in a new orchestra called Dreamboat Jazz Band that had the New Orleans revival jazz as their specialty and that often exhibited their music in church concerts. In 2002 they made a tour with clarinet player Orange Kellin, which also resulted in a CD. In the summer of 2007 Paul was co-producer and master of ceremonies at a major celebration of the city of New Orleans at an open-air concert in Malmö, where also the newly formed Paul’s New Orleans Gang performed. The orchestra has given further concerts in among other places, the largest church of the city with a resulting live CD released in 2008. Paul Strandberg’s work as a tutor continues and one of the latest results is the formation of Mattson’s Serenaders an orchestra that has chosen New Orleans Rhythm Kings as their model and in which Paul participates as their clarinet player. They have participated and won much approval at the festivals at Saint Raphaël and Megève, France since the summer of 2008. In 2013 Paul was once again offered the place of first trumpet player with world famous danish Peruna Jazzmen, which he happily accepted since it has been one of his favorite bands for more than 40 years. The band plays regularly in Copenhagen and all over Denmark. Today (2015) Paul is also member of several other more or less active orchestras. While often performing for a senior audience as a duo of clarinet and piano with vocals together with Kiki Desplat he is also aiming at entertaining a growing, very appreciative and curious young crowd at many venues in and around his hometown. He is often joined by his 19-year old daughter Angela, trumpet and washboard to perform for the young lindy hop dancers with bands like Sweet Lorraine Jazz Band, Lufsen Swingsters and Red Gryphon Jazz Band. With New Orleans Sunshine Orchestra he every second weekend plays brunch concerts with his Albert system clarinet in trio or quartet in Malmö and nearby Lund. In cyberspace a worldwide audience, every Christmas (and at any time of course) can enjoy Paul performing with the Robot Jazz Band in a little fascinating film on YouTube: “Jingle Bells at the Museum”.